Analysts at Anderson Partners Food Ingredient Marketing in the US have come up with this handy round up of some key 2017 trends reports to help you find your way through the clutter and make sense of the new trends that are the most important to you and your customers.. 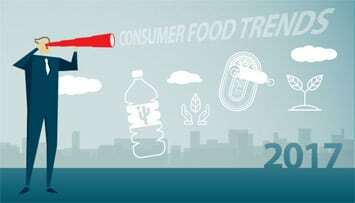 THE NEW YEAR IS HERE and with it comes another new season of food trend forecasts and analysis. Food manufacturers and food service operators want to know what their consumers are looking for in new food items and new flavours. Food ingredient marketers want to support their manufacturing and food service customers with consumer insights and with an array of new ingredient products and flavour solutions that can help keep them all on trend. Every year it seems like there are more and more food trend forecast reports flooding the marketplace. Each market research firm in the space has its report on the latest and greatest trends. Every trade magazine and industry website screams out headlines on the “Top Trends” and “Best Insights,” while every flavour company, ingredient marketer and food service supplier seems ready to put its own spin on the latest trends. The team of food marketing analysts at Anderson Partners Food Ingredient Marketing is here to help you…. For several years now, it has been publishing a series of reports that “round up” the best trend forecasts, providing summaries of key trends and links that take you directly to the leading forecast reports. This year, its team has prepared three different Roundup Reports covering key trends for consumers, foodservice and flavours. In her report, 2017 Consumer Food Trends Roundup, food marketing analyst Elizabeth Murphy takes a close look at the Innova Market Insights’ report on how ‘Clean Supreme’ Leads Top Trends for 2017. Indeed, clean label continues to be the leading food industry trend again this year. The consumer trends round up continues with the MarketWatch article on The Next Hot Trends in Food. The roundup also includes Mintel’s latest report on Food & Drink Trends 2017 that explores the growing importance of convenience for time-starved consumers. Analyst Liz Bloyd reports in this year’s Foodservice Trends Roundup that 2017 will continue to focus on the customer experience and on how their food gets to their plate. She links to the annual forecast report from The NPD Group that focuses on key trends to watch in 2017, including food delivery services, sourcing from local suppliers, more healthy choices and new twists to classic dishes. The latest report from Baum + Whiteman details many of those new twists including center-of-the-plate attention to vegetables, creative new breakfast options and the proliferation of new ice cream formats. Anderson’s Flavour Trends Roundup, from analyst Deb Murray, explores how the flavour industry continues to search for innovative ways to answer consumers’ increasing demands for more exciting, natural flavours and exotic flavour combinations. Links to reports from both the National Restaurant Association and Comax flavours show how the search is on around the world to find new flavours and flavour combinations to match up with consumers’ adventurous taste buds. The granddaddy of all flavour reports, The McCormick Flavour Forecast also predicts how global flavours will make many different, unexpected appearances in both food service menus and new food products. Overall, Anderson’s Roundup Reports forecast an exciting year for the food industry. Many of the trends it has examined are focused on new ingredients in classical applications or on familiar ingredients in new applications. Either way it should be a very tasty new year!